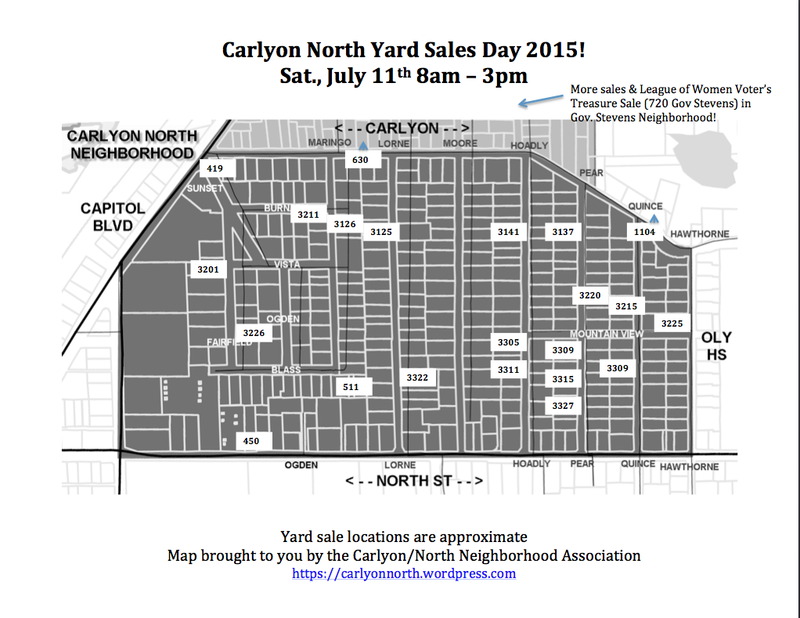 The annual Carlyon/North Neighborhood Association Yard Sales Day is set for Saturday, August 11th from 8am – 3pm! The summer neighborhood party will follow in the early evening at Coralie Carlyon Park (formerly Angle Park). As in past years, each participant will host their own yard sale, and we encourage you to have your own signs. But, we will advertise locally about the event in The Olympian and on social media, have signs directing people to the neighborhood, and distribute a map of yard sales in the neighborhood. Our neighboring Governor Stevens neighborhood (north side of Carlyon Avenue) will also be participating, so a great day to sell or find your treasures! We look forward to seeing everyone out at the sales and party! Thank you to everyone who came out to our Candidate Forum on Thursday, October 15th at South Sound Manor! We had over 50 people in attendance from all of our participating neighborhoods. We heard from our Olympia City Council and Port Commission candidates on our panels, as well as from Olympia School Board candidates and Olympia Parks Prop 1 representatives. A special thanks to our sponsoring neighborhood associations: Cain Road, Governor Stevens, South Capitol, and Wildwood, to our moderators Meghan Sullivan and Pam Folsom, to South Sound Manor for their generous support, and to our many other volunteers. but we will advertise locally about the event in The Olympian and on social media, have signs directing people to the neighborhood, and distribute a map of yard sales in the neighborhood. The Thurston County League of Women Voters will also be hosting their Treasure Sale in our neighboring Governor Stevens neighborhood (north side of Carlyon Avenue) on the same weekend, so a great day to sell or find your treasures! To be included on the neighborhood map, notify us by Wednesday, July 8th. Contact us at: carlyonnorth@gmail.com and provide us with your name, home address, and e-mail. Payment of $10 annual membership dues is strongly encouraged, but not required for being included on the map. Bring your kiddos and their baskets to hunt for eggs in nearby Trillium Park on Saturday, April 4 at 1 PM (Hoadly & Gov. Stevens). Rain or shine, this event is fun and free. We’ll also be collecting non-perishable fo od donations for Thurston County Food Bank, so please bring some to help out those less fortunate. This event is made possibly by some of the annual C/NNA membership dues, but is open to all who live in the neighborhood. We’ll have a board member present to collect dues (just $10 per household) if you would like to join or renew. Questions? Want to volunteer? Please contact us at carlyonnorth@gmail.com, or call Carl See, Board President, at 206-979-1375. A special thank you to Heidi Magaro for coordinating this year! “Officers are investigating suspicious circumstances in the 3100 block of Hoadly that may involve burglary and assault. Detectives are also on the scene. Stay aware: Daily crime updates for are available at: https://www.crimereports.com. Search by address and date range. Connect with your neighbors: interact with you neighbors, take walks in the neighborhood, be on this listserv, join our Nextdoor page and Facebook pages, participate in local events with neighbors (block watch, school, neighborhood association, church, etc.). Report suspicious activity as soon as possible to the Police at the non-emergency number (360-704-2740). Suspicious activity may include unlicensed solicitors, unknown people peeking into backyards or windows, or people walking/biking/driving around in a way that seems they are “casing” the neighborhood. Report suspected crimes – big or small – to the Police at emergency number (9-1-1). This includes car prowls, even if meant just a loss in small change. The Olympia PD uses this information when determining how to distribute patrols, especially as patterns emerge. Stay secure: lock your doors & windows, both for your car and home, and turn on the porch light. Let a neighbor know when you’re going to be away for awhile. Pick-up trash & drive slow – both are visible signs that we’re taking care to keep our neighborhood safe and clean. Neighborhood crime update – happily, nothing recent to report. In light of the neighborhood burglaries in September, we have invited representatives of the Olympia and Tumwater police departments to join us for our Fall Neighborhood Gathering on Nov. 20th (6:30-8pm, Pioneer Elementary). Also, if you’re headed out and about on Halloween, check out the safety tips from the Oly Police. In addition, we encourage you to sign-up for the Carlyon/North Halloween map either on our Nextdoor page, or by contacting us at carlyonnorth@gmail.com. Being on the map will indicate that you’re providing candy (from about 6-9pm), and have kid-friendly decor. Maps will be available at least on-line in advance of Halloween. With 2015 quickly coming upon us, we are seeking board member nominations for the Carlyon/North Neighborhood Association. Yes, now is your opportunity to join with your neighbors in helping make this community a better place! Terms are for 1 year (Jan-Dec), with elections in November. Nominations are open until our elections at our neighborhood gathering on Thursday, November 20th (6:30-8pm @ Olympia High School, room 001). To nominate yourself or another person, please include the full name of the person being nominated, as well as a street address and contact info (phone and/or email address). All nominees must be a Carlyon/North resident and/or homeowner (renters welcome!). Details on available positions are below, but if you have questions, direct them to carlyonnorth@gmail.com or to Board President Carl See at 206-979-1375. Carlyon/North hosts 3-4 events per year. The past couple of years that has included the Spring Egg Hunt in April, the Summer Yard Sale & Neighborhood Social in July, the November General Meeting / Election Forum, and the Thurston County Food Project pick-up days (every other month). As time allows, expected project/tasks to be led up by board members in the upcoming year include grant writing; volunteer coordination; membership development, website, email, & social media communication; neighborhood safety awareness; liaison work with local businesses, cities, schools, and neighborhood associations; food project coordination; and the newsletter. Board meetings are held monthly. This past year, we have met on the 1st Wednesday of each month from 7-8:30pm at a local restaurant or a board member’s home. In addition to board positions, we are always seeking volunteers for distributing newsletters 3-4 times per year, to assist with logistics for each event, and to support our Thurston County Food Project program. White female, late teens/early 20’s, dark long blonde hair – 5’3″ – 5’5″. Last weekend she was aggressively soliciting homes, offering to vacuum your home. Tumwater Police have a suspect matching this description on video committing a burglary in another part of town. From resident accounts, these two suspects have been working together. The two case neighborhoods before their burglaries. For example, the vacuum soliciting scam over the weekend. They then enter homes through back yard entrances (doors, windows) after knocking on front door to determine if anybody is home. This seems to be the case for the burglaries on Monday. From resident descriptions they travel on foot or bike. So, please be cautious, and remember that solicitors must have permits. If you open your door to solicitors, ask immediately to see their permit. If they are legit, they’ll be happy to share. Permits are valid only for the calendar year in which they were issued. Sat., Aug. 9th – Thurston County Food Project Pick-Up Day! The next pickup is this weekend on Saturday, Aug 9. Please place your green bags (or any bag will do!) out on your porch by 9 am. I attended a meeting with a representative from the Thurston County Food Bank, Fran Potasnik recently. She wanted to thank all of us in Carlyon/North for participating in this invaluable program. She also wanted to report first hand that the food bank shelves are running low this month. The big winter “holiday” drives and all the bounty they bring, have dried up. So that makes our TCFP “green bags” project really important this time of year. Anything you can spare is appreciated. Remember, cash is always welcome, just seal it in an envelope with Food Bank in big letters and drop it in your bag. Also, extra bounty from your garden, or extra produce from your stop at Cosco is also welcome along with the non-perishables. Too many apples dropping off your tree? Just pack them up for the food bank! If your own cupboards are running low, don’t feel bad to just leave a can or two out, or even take a month off if needed. Going away? Shoot an email and include your phone number and we can arrange to pick up your bag earlier in the week. No time to make special arrangements? No worries, just go have fun and we will catch you next time! A special welcome and thanks for joining to our new participants including Josiah & Belle, Leslie & Scott, Maggie & John, Steve, and Harriet. As always, let us know if you need more information or if you want to volunteer to help with pick-ups on either a one-time or ongoing basis. It’s fun to see our neighborhood coming together and helping others.